At Bich Dong there’s a series of pagodas and a fascinating collection of caves farther up the outcrop. Some of these caves were used by the Viet Minh to hide from the French during the First Indochina War. The caves are full of stalactites that have been carved into Buddhist images, as well as stalactites that are hollow upon which tunes can be played. You can climb all the way to the top of the outcrop, from where there are fantastic views over the surrounds. The rice paddies all reflect the surrounding peaks giving the effect of an emerald mirror. 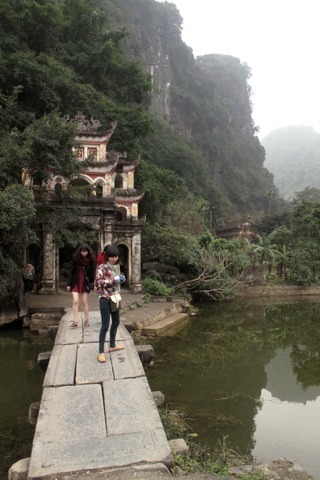 For stunning views across Tam Coc and Bich Dong you’ll have to put some effort in: 500 steps of effort to be precise. The vantage point is located a good few kilometres from Tam Coc, with steps built into the side of a hill. At the top is a statue of Quan Am and a small shrine, but it’s the views you’ll be wowed by. To get there from Tam Coc, head along the wide road towards Ninh Binh, and after couple of kilometres you will see a pond on the left, with a large tree with many roots at the corner. Turn left after this pond and keep going. You’ll see a sign for Hang Mua on the left. To get here from the railway station at Ninh Binh, go straight ahead, up to the main road (Le Dai Hanh St), turn left and follow it to the main four way intersection. Turn right then left so you are following the river with the canal on your right and continue along the main road for about 4km where you then take a right turn down a wide road with large stone pillars on either side. Continue along this road for another 4km and you will come to where the boats leave at Tam Coc. From here, continue through the town and follow the road for another 2 kilometres. Entry is free but you'll have to pay for parking.